J. RAPKIN. Map. New York: J. & F. Tallis, from The Illustrated Atlas. ca. 1850-51. With Illustrations by H Warren & Engraved By J. Wrightson.Sheet measures 14.5 x 10.75"; image 13 x 9.75". 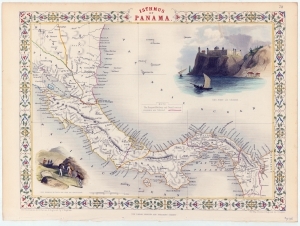 The Panama Railway opened in 1855, providing the infrastructure that would determine the location of the future canal, which began construction in 1880.